Coconut Oil – Creates a bubbly rich lather that moisturizes while cleansing and toning the skin. 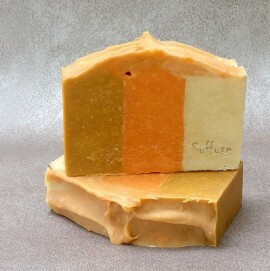 Olive Oil – Provides a creamy conditioning lather to relieve dryness and makes the soap milder. Sweet Almond Oil – A rich source of Vitamin E, it nourishes, soothes and protects dry and irritated skin. It effectively softens the skin and makes it supple. It is also beneficial in treating skin ailments. Castor Oil – creates a stable, creamy lather with anti-oxidant and anti-inflammatory properties. It’s a humectant which attracts moisture to the skin and helps retain the natural moisture balance of the skin.